Much like a favorite candy or go-to karaoke song, pretty much everyone has that one fast food joint they'll walk, drive, or crawl well out of their way to go to after an especially late night out. Traipse through the busy streets of any city after last call and you're bound to see plenty of folks lining up for a to-go burger, burrito, or slice of choice. But just which chains win out most often among the late-night crowd at large? Some experts crunched the numbers and figured out just which fast food restaurants are most popular after hours. The new research comes courtesy of the team at MattressAdvisor, who surveyed over 1,000 people about their after-hours snacking habits. Specifically, they asked what their favorite late-night food stop is, how far they'd be willing to drive to get the meal they wanted, and which types of food they most regret eating the morning after. 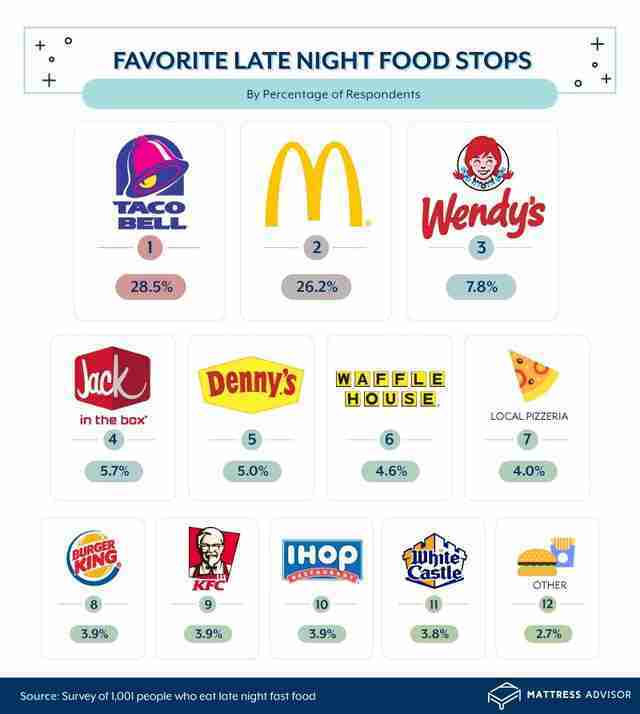 Topping the list as the go-to favorite was Taco Bell, which 28.5% of respondents named as their preferred late-night munchies destination. Following closely behind was McDonald's, where 26.2% of people would ideally go, followed by Wendy's, which 7.8% of people like the most. Here's how the top 12 chains rank. 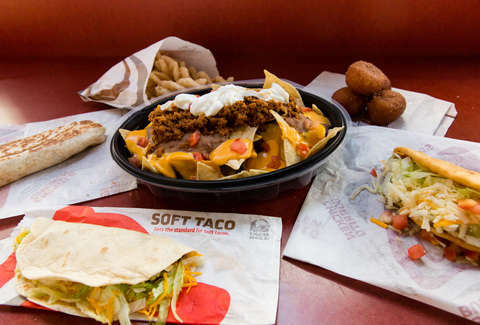 Interestingly, while Taco Bell earned bragging rights as the favorite, people will travel much further for other chains. In fact, when ranked according to how many minutes people would go out of their way to get what they want, KFC tops the list at 24, followed by Denny's, and then IHOP. Meanwhile, people who crave Jack In The Box, Wendy's, and Taco Bell are only willing to travel between 11 and 13 minutes to get it. In terms of where people regret eating the most the morning after, the survey grouped the establishments more generally, but "chicken restaurant" topped the list with 82.5% of respondents saying they felt the worst after eating at them ("pizza restaurant" and "taco restaurant" were number two and three, respectively). And while late-night menu preference may be subjective, there is one undeniable truth when you're hungry and in a hurry for fast food after hours: not all drive-thrus are created equal.